in the wp-config.php file is the end of the story. Let’s discuss how we can improve the debugging process of our WordPress-based web app. As you probably know, enabling WP_DEBUG forces the application to collect and report all levels of errors. Making WP_DEBUG_LOG true also records these errors into wp-content/debug.log file. Errors get logged and reported, nice. But what if we want to log our own error messages? Or better yet, display contents of a variable on a web page? var_dump the variable, see what’s inside, remove the var_dump and continue, right? A while later, I need to see the contents of the same variable again so I have to write yet another var_dump and then remove it. But wouldn’t it be better if I didn’t have to remove and add these functions? What about logging the variables and displaying the logs conditionally and in a controlled manner? Only if WP_DEBUG is enabled, for example. Some developers came with a simple solution: write a custom logging function for reporting your own messages. Then, you would just write log_me('my super important message') somewhere in your code and your message would be then recorded in the debug.log file. Cannot specify error level. What if I just want the message to be of E_USER_NOTICE level? Have to include this custom function in all your WordPress projects. PHP has a secret function called trigger_error. It fires an error of specified type (level) with a custom message. The default type is E_USER_NOTICE, which is suitable for logging contents of a variable or custom messages. Open wp-content/debug.log and see for yourself. The message and $query are recorded in the file. no errors are logged or displayed anywhere! We don’t have to remove the calls to trigger_error even when moving the site to production (live) server. Want to see the messages or contents of variables? Just enable debugging in WordPress. 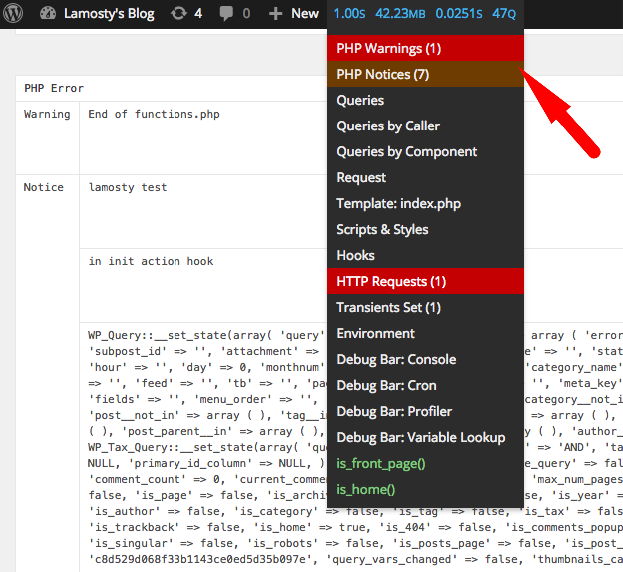 Reload your WordPress site and inspect the browser’s console. All triggered messages and errors are present there. Pretty neat, isn’t it? I hope I’ve convinced you that using trigger_error function better than logging the errors directly because you have a much greater control of what and how things get logged. Even better than logging the output of function calls or variables is to write Unit Tests but I’ll leave that for another day. Don’t forget to install Query Monitor plugin. It has its own error handling routines displaying the messages in a nice UI.